All transactions are safe and secure with a reliable history in online purchasing behind each of our associates. Buy the Clark Griswold's Rant About his Boss t-shirt to own Christmas Vacation clothing and merchandise. 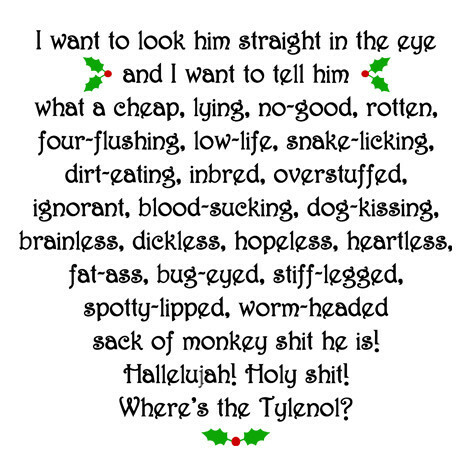 The front of this National Lampoon's Christmas Vacation tee displays Clark Griswold's quote about his no-good, blood-sucking boss, "I want him brought from his happy holiday slumber over there on Melody Lane with all the other rich people and I want him brought right here, with a big ribbon on his head, and I want to look him straight in the eye and tell him..." The rest of Clark Griswold's kind words about his boss are displayed on the front of the tee. It's perfect for a ride in your Family Truckster. In addition to the Clark Griswold's Rant About his Boss tee above, browse the Christmas Vacation Clothing Gallery for more apparel like men's and women's clothes, kids shirts or hoodies.